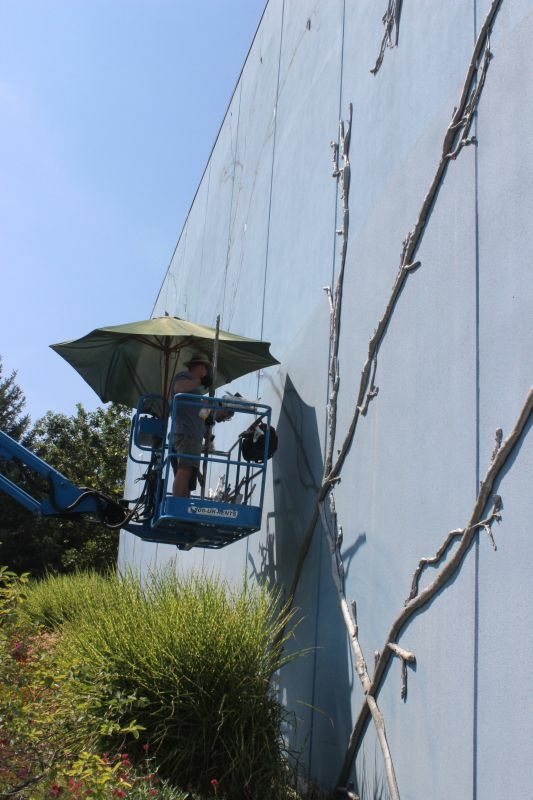 If you've driven by the Arvada Center in recent weeks, you may have noticed that the aluminum sculpture branches on the blue walls of the outdoor amphitheater have been removed and that the walls have been undergoing some changes. 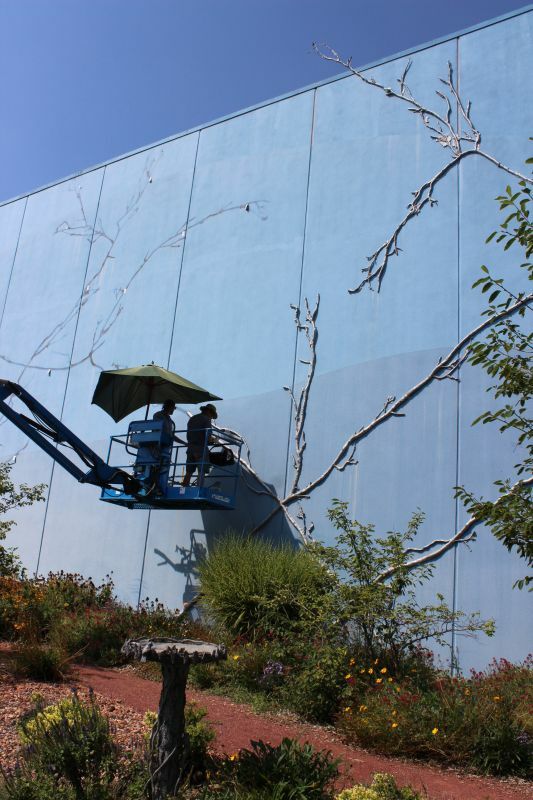 "Skyline," as this public art piece is titled, is undergoing a complete restoration to return it to its original condition. 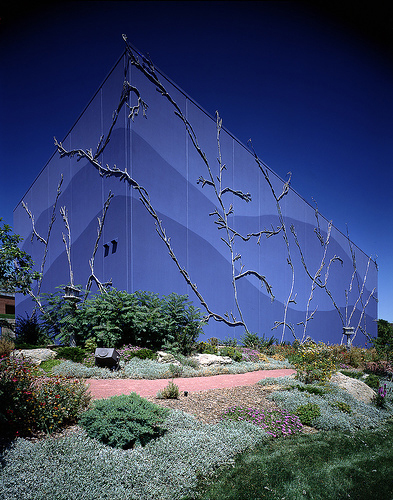 A regional icon for integrating sculpture with architecture, "Skyline" was designed by artist Clarice Dryer and was installed at the Center in 1992. 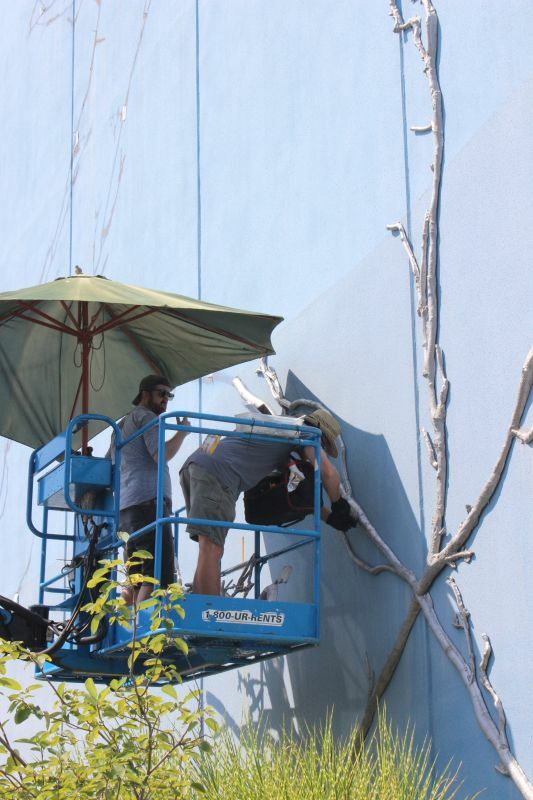 During the first phase of restoration, the aluminum branches were removed and cleaned, their reinstallation awaiting the repainting of the walls. Finding an exact match for the original paint color proved challenging, however, because it had been 23 years since the walls were first painted. Crews painstakingly searched the walls for areas that had not been faded by the intense sun exposure on the eastern and southern walls. Fortunately, they found a protected spot, and a color match was made. Painting is now in progress! The completion time for the restoration project is estimated to be mid to end of October. If you are planning to attend a class or a performance at the Arvada Center during the restoration project, please note that the access drive just off of Wadsworth Blvd. that runs along the south side of the Arvada Center will have partial closures during the construction period, but the public can access the Center from Wadsworth. Vehicles exiting the parking areas are being directed south to 68th Ave. Traffic impact has been minimal.